As we turn the weekend into our last week of CMRS it’s increasingly clear to me that I’ll barely have this blog caught up through October before I’m back in Minnesota celebrating Christmas. Because I’ve used it (and intended it) mainly as a mechanism of updating those at home as to my activities, I’m not sure whether to continue updates once home. Certainly I have enough writing on my plate come January to warrant abandoning this project, at least temporarily. However, it seems a shame to write off the dozen posts I have planned. We’ll see how things develop as the program wraps and school begins again in January. And if you have a preference, why not leave a comment below? On Halloween, Bekah and I returned to London for our second visit. Our first saw us at the Tate Britain and pushed somewhat rudely through British Rail. I’m please to report our second time was much more enjoyable. We wanted mainly to walk and see as many landmarks as possible. With that in mind, we plotted a route from London Victoria through the Buckingham Palace area, to Savile Row, then through Piccadilly Circus and Trafalgar Square to St. Paul’s Cathedral, the Millennium Bridge, and the Tower of London and its WWI commemorative installation, the famous Blood Swept Lands and Seas of Red. Narrating the complete journey would be somewhat tedious; I won’t do so. Instead, I’ll comment on the most salient features of each part of the journey and then place a photo gallery below the text. 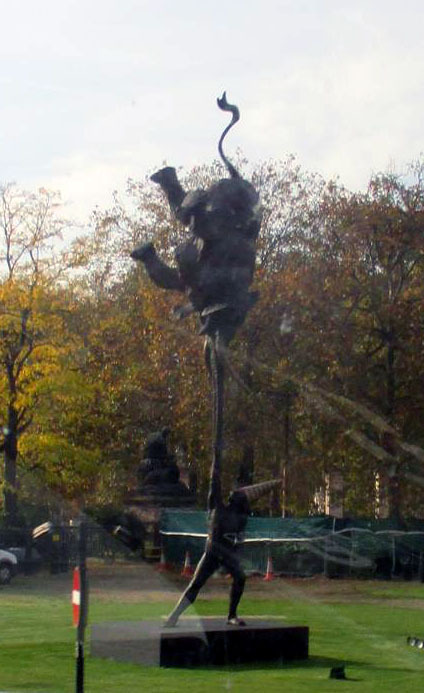 North of Buckingham is Green Park which contains, among other things, the Canadian World War II Memorial. On the way to Savile Row, we stopped by the Royal Academy of Arts complex. Why? It looked interesting, not least because the courtyard featured a large aquarium tank in which were suspended various sized U-boat models ranging from a few feet to a few yards in length. Next to the Royal Academy of Arts complex is a covered street which we used to continue toward the Row. 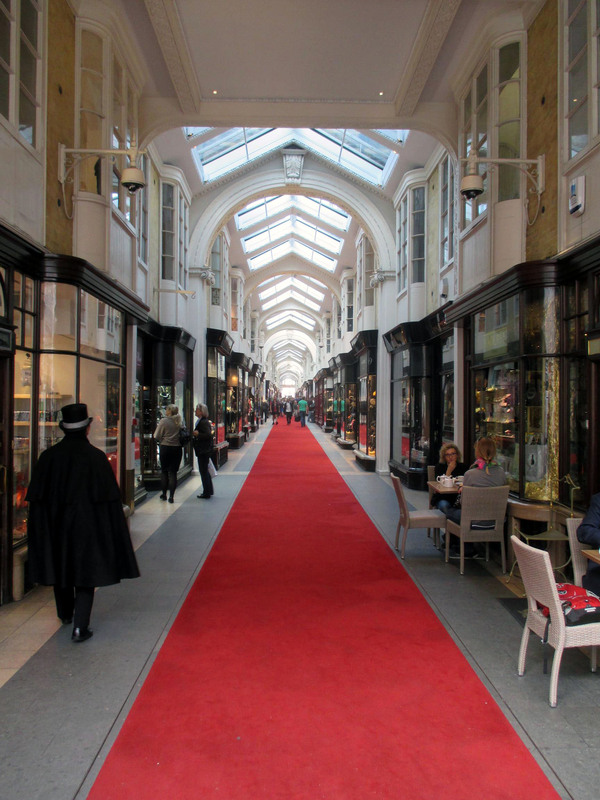 The Burlington Arcade was the first place in London where we felt like unlettered simpletons. I doubt any one item in the display windows could be had for less than £10,000; the entire street consisted of jewelry, watches, and couture designer goods. I had opted to wear tweed that day, and the Arcade thoroughly reminded me of my sartorial sin; only worsteds are appropriate for city life, to say nothing of my lack of black footwear. After navigating a few more turns, we came out onto the Row. Savile Row is far more storied than any 1,000 words can convey and nothing I write here will contribute much in quality or style to the volumes already written on the tailoring which takes place there. Briefly, Savile Row has been the center of London bespoke tailoring for well over a century and from there, has radiated English style across the world. And as much as the Italians and French would like to deny it, even their distinguished tailoring houses have been indelibly affected by the Row. 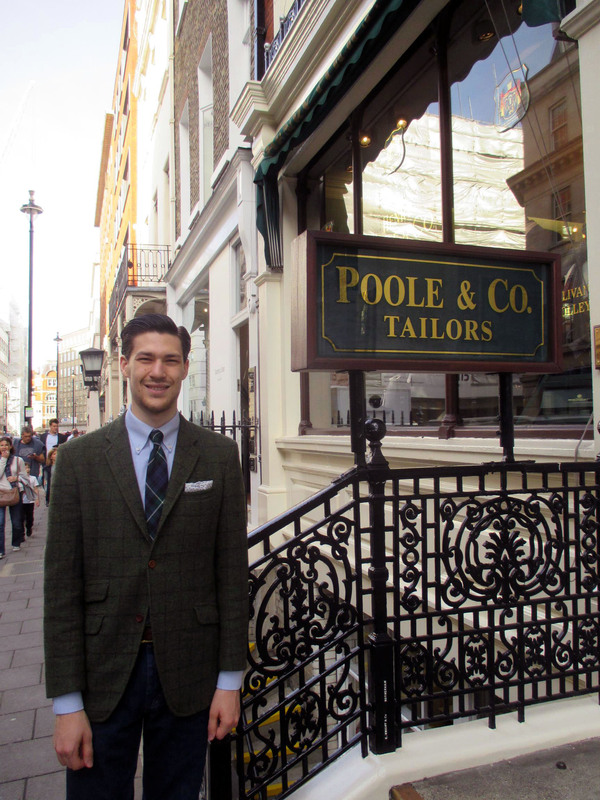 Houses such as Henry Poole have been credited (in what is albeit a contentious issue) with the creation of the tuxedo. Less controversially, most of the men of Golden Era Hollywood were outfitted on the Row, including such style icons as Fred Astaire, Douglas Fairbanks Jr., Cary Grant, and Humphrey Bogart. Many of the houses have cut for the British monarchy (several still hold Royal Warrants), and a many more have cut for European nobility and royalty, including Napoleon. Although each house has its own style (controlled largely by the eye of its cutting staff), all offer bespoke service, i.e., tailoring which is created individually for each client. The creation of a suit begins with a series of measurements taken by the cutter – the person in charge of drafting the pattern, marking the cloth, and cutting it. Needless to say, a full range of cloth and pattern is available for selection, to say nothing of the unlimited choice of style and accessories such as buttons. Once cut, a suit is worked up by the tailors (those who actually do the sewing. In bespoke, the cutter is actually far more important than the tailors, although it is the latter’s skill which imparts the quality finish to the suit) and given several fittings during which the client and cutter discuss and adjust the fit. The full process can take well over a year. Such service does not come cheap; the most inexpensive two piece service on the Row will run about £3,000. 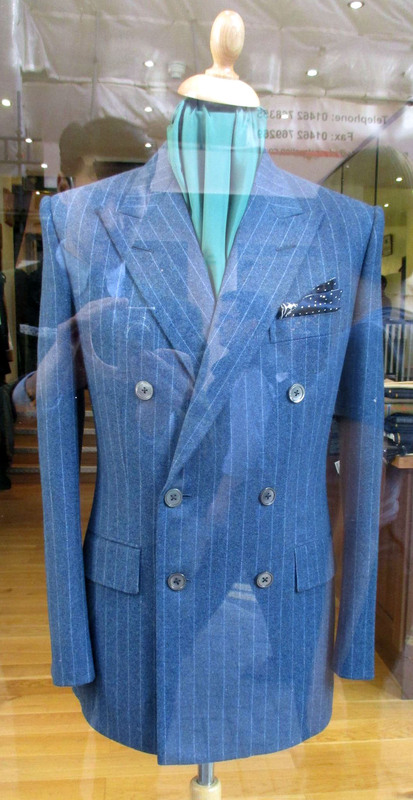 With luxury cloth options, extra trousers, and waistcoat, a suit can quickly run into the mid £10,000s. And as expected, some houses are more expensive than others. Much more (Here’s looking at you, Huntsman…). While a suit from the Row is only slightly out of budget at the moment, one can dream, and I enjoyed very much poking into each store and seeing the legendary street. (A few blocks south is Jermyn Street, the equally famous home of London shirters). I’ve included below the first of a many-part video series documenting the bespoke process. It’s well worth glancing at a couple of the episodes to get an idea of how complex and time consuming the construction of a bespoke suit is. While it may still be difficult to justify the price, I suspect the videos will reveal the artistry and skill that go into tailored clothing – the two elements which draw me the most to tailoring. … Trafalgar Square (enjoyable). At the top of the square sits the National Gallery and at the far east end, the Church of St. Martin-in-the-Fields, famous to any follower of classical music as the artistic home of Sir. Neville Marriner for many years. Marriner was, of course, the seventh music director of the Minnesota Orchestra, and is thus a familiar face in Minnesota as well as London. Today, Joshua Bell – another superstar – directs the orchestra. We got slightly lost after Trafalgar and ended up back near the houses of Parliament instead of continuing east along the Thames. The detour was well worth it, as we were able to see a variety of war memorials along the way. Most striking was the memorial to the Battle of Britain and the civil servants, airmen, and civilians killed during that conflict. Making our way east along the north side of the Thames, we finally reached the Millennium Bridge and St. Paul’s. The Cathedral was massive (and equally expensive to enter – 18 pounds!) and we elected to merely snap a few photos of the south facade. The light was growing progressively more golden as the sun headed down in the sky and we wanted to get to the Tower before dusk. Blood Swept Lands and Seas of Red has generated much publicity over its life. And while I do sympathize somewhat with some of its detractors who claim that by focusing only on British loses the memorial perpetuates the nationalism which contributed to the war’s slaughter, the work is intensely emotional. The poppies crowd so close in places – one poppy for each British death in the war – that a square foot yields ten or more men. When the entire CMRS program is represented by slightly more space than a standing person occupies in the installation, it’s easy to begin to imagine the impact of the war. Begin, but not finish imagining; when finished, the work has 888,246 poppies. 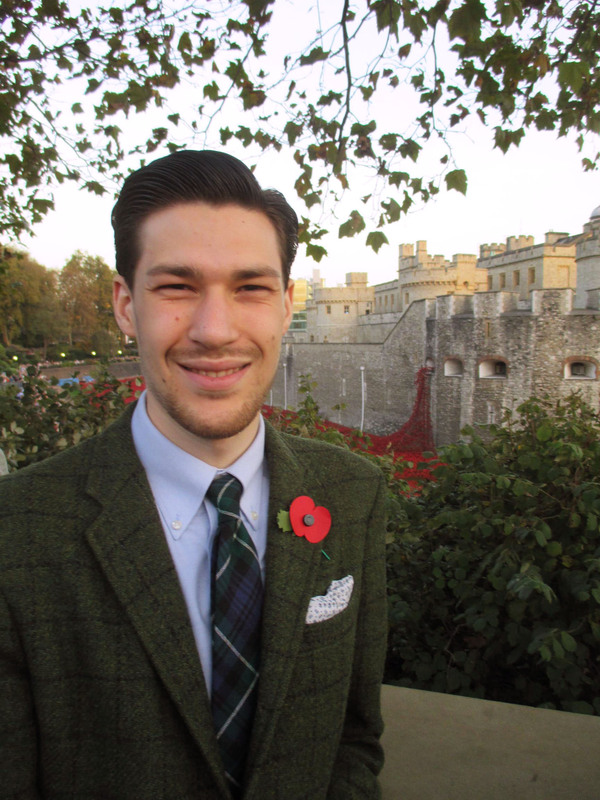 As I wrote about in my first month in Oxford, feeling history is remarkably easier in England than in the States. The Tower was no exception. On our return, we decided to forego the tube temporarily and walk along the south bank – the notorious Southwark – until we were tired. This after crossing the Thames on the famous Tower Bridge. On the south bank we saw the Globe up close, as well as a number of interesting buildings from newer London. Finally tired (we ended up walked over nine miles that day), we cross north on the Millennium Bridge and caught the Green Line back to Victoria Station.